Writing academically accurate research works demands abidance to established rules of formatting texts. Each country and its institutes provide their own writing formats taking into account local specifications. But there are few internationally accepted formatting styles. One of the most recognizable is the MLA writing standard. It is an abbreviation for The Modern Language Association. The activity of this organization concentrates on popularizing teaching and studying of modern languages such as English. As for the practical significance of this association, it publishes The MLA Handbook for Writers of Research Papers – a special guide for properly editing texts academically. This manual is a desk book for each research writer in North America. The researchers that predominantly use it are in the field of humanities (literature, history, philosophy, and English studies). This fact makes this format one of the most widely used writing standards. The margins are placed at 1 inch all around. The text is recommended to be typed using a common font such as Times New Roman. The font size is strictly 12 pt. Spacing implies two rules: double-space the text and single-space separation marks. The Indentation rule requires half-inch spacing from the left margin. A hint to use the Tab key to improve the time-management. Pagination means placing numbers of the pages to the upper-right corner of a created header. Usually, numbers are set from the first page successively to the last and Arabic numerals are used. If having endnotes in the text, they are to be written down separately from both the main body text, and works cited page. The last rule, which usually is the opening one, but today it`s unconsciously clear that text should be typed on a computer and printed according to standard 8.5" x 11" white paper. MLA style insistently advises proofreading the text carefully in order to find and fix mistakes. As the style is formal, this quality assurance task is essential to demonstrate a professional format consistent with MLA standards. It also gives some well-known but unforgettable advice such as usage of grammar and spell checking, double copying the file, and looking through the printed version in your word processor. While general technical recommendations of how to format academic text in this style are almost similar to other style`s framework, paper structure tangibly contrasts and has unique rules. This style is usable in the humanities environment because of the simplified demands which allow concentrating less on formatting but more on work. For detailed information read an article about MLA research paper outline. While MLA formatting proposes to omit the title page, there still are rules of how to format the first page. Starting from the upper-left corner of the main page, indicate your name, the next line identifies the name of your instructor, the next with the course and the last with the date. The next line introduces the title of the paper. Make it centred. The title doesn't need special font markings or quotation marks and is advised to use standard capitalization. Marking with fonts or quotation is only acceptable when the title cites other texts. Numbering starts with the first page, and you have to create a header, which identifies the number of the page itself and your last name before the page number. The header format coincides with pagination rules described above. Section headings help writers organize the paper most appropriately. The section itself means dividing information into sections that gives more structure in both editing and perceiving information. The MLA standard has no strict rules of how to format section headings but advises to use Arabic numerals for numeration of each and to put the name of the heading after space. If a subheading is needed, number it by a coherent period (1.1, 1.2, 1.3, etc.) and place it directly below the main heading. As it is left to the discretion of the writers, MLA formatting doesn`t have any requirements for the body of the text. It considers the long-established rule of the essay structure, which recommends writing three body paragraphs along the paper to support the idea of the research, but it is not mandatory. You may use five, seven or even a single paragraph, but keep in mind, that a paper should have an introduction, a body, and a conclusion. Rules of quoting and citation are the most valuable rules in the framework of MLA research paper guidelines. The question of academic honesty is acute and accurate citation becomes the most important thing in how to write research papers. The rules of an in-text citation are used in the form of parenthesis. Meaning, putting the authorship in the parenthesis after every quote that implies citing. The data used in this parenthesis should coincide with the bibliography section. The form of citation also differs from other writing styles. Quotes shouldn`t be marked with a quotation mark, but rather with parenthesis that includes the number of the page of the work the quote is derived from and the author`s last name. The works cited page, or bibliography is necessarily to present at the end of the work. It includes all external sources to which the writer refers. This list not only shows which literature the writer used while writing the paper but also confirms the credibility of the citation. MLA formatting shows itself as a convenient way of formatting research papers that allows the writer to write, but not to dwell too much on formatting. Starting with the absence of the title page and finishing with font types and margins, the writer appreciates the style he chooses. Since this format style is used preferably in humanities, citation rules are more demanding, but today it is vital to cite accurately. 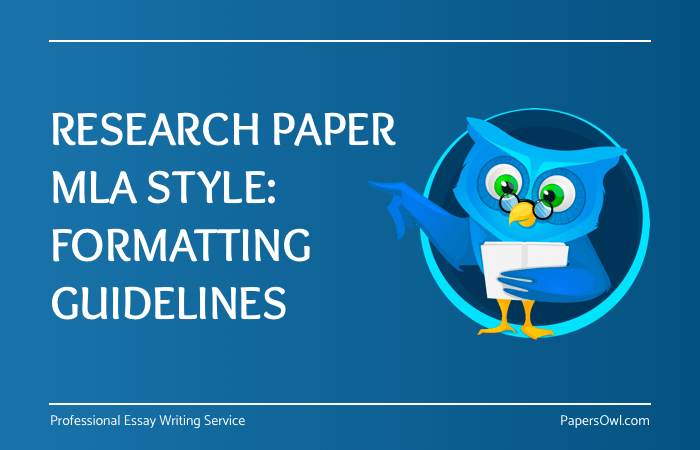 Keep in mind that formatting style helps to write academically accurate papers and concentrate on the information, but the idea of the research could be supported only by the writer.